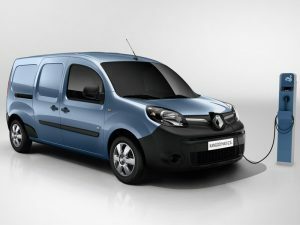 Renault is to present a new Kangoo Z.E. with 50% more range at the 2017 European Motor Show in January, following the addition of a new motor and battery package. New Kangoo Z.E. has a driving range of up to 168 miles (270km). The event in Brussels will see the Renault Pro+ division unveil its latest Kangoo Z.E. which features a new motor and battery package that will increase the model’s driving range from 106 miles (170km) to 168 miles (270km) NEDC; equivalent to 124 miles (200km) in real world driving conditions. The manufacturer said the new model will offer the longest available driving range in the small van market. The longer-range Kangoo Z.E. Renault’s recent launch at the 2016 Paris Motor Show of the new ZOE, which features a 250-mile range under NEDC conditions. More details about the new Kangoo Z.E. including launch date will be revealed on 13 January at the show.